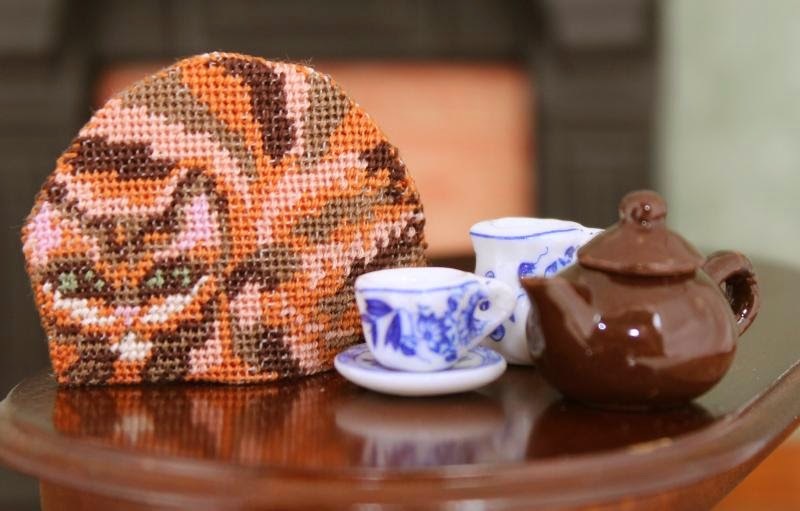 Artisans in Miniature: A little ‘Ginger Cat’ teacosy for cat-loving doll’s house dolls!! A little ‘Ginger Cat’ teacosy for cat-loving doll’s house dolls!! New on Janet Granger’s website is a ‘Ginger Cat’ teacosy kit, so if you love cats, this could be just what you’re looking for. It is quick to stitch, and easy to assemble. Just the thing for the miniaturist who also loves cats! The teacosy is to be stitched on 32 count silk gauze. The kit contains stranded cotton, a generous piece of silk gauze, clear instructions and stitch diagrams, a suitable needle and a colour block chart to count the design from. The kit costs £12.95. P&P is £1.75 per order if placed by post (cheques to Janet Granger); p&p is free online if your order is over £40, otherwise it is £1.75 UK / £3.50 overseas. Various designs of teapots and tea sets are also available to complement all the teacosies that Janet has in her range. If you haven’t stitched in this scale before, or you would like to know what is involved in making one of these kits, visit the FREE ONLINE TUTORIALS page at www.janetgranger.co.uk/tutorials.htm and see how easy it is to create this little teacosy. How perfectly sweet! And thanks for the link to the tutorials. I have little natural skill in this area and need all the help I can get.